I fell in love with Portuguese food the first time I had mariscada. 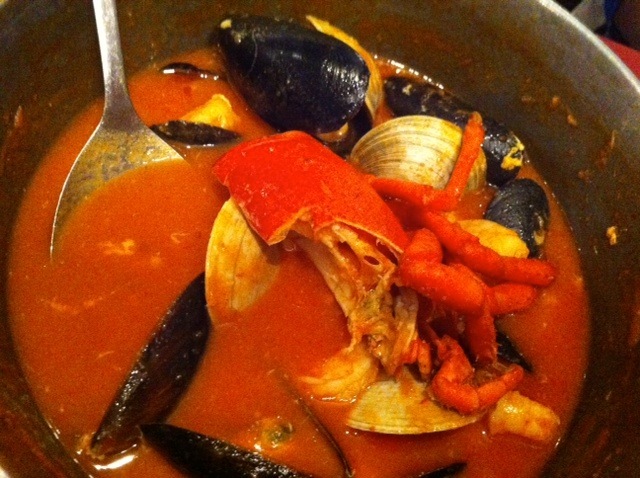 In honor of our trip to Portugal this month, I wanted to share with you this wonderful recipe for Portuguese seafood stew. We get mariscada every time we go to visit Kate's grandparents on Long Island. There's a place called Ole in Farmingville, NY — if you live nearby, you've got to go! Kate was about 18 months the first time we ate there. She ate a whole plate of garlic shrimp all by herself. Mama was happy, glad to see her getting lots of vitamin D. We always get the garlic shrimp to start, and then get the mariscada with rice. We also always get a pitcher of sangria (white wine with fruit) and enjoy the rolls with lots of butter. Mariscada, made with broth and tomato puree, is not only delicious, but it's also incredibly good for you. Shellfish, particularly mollusks, is very nutrient-dense. This is because you are eating the whole animal. When you eat organ meats from animals, such as liver or heart or brains, you get anywhere from 10-100 times the nutrients than you get from muscle meats such as chicken breast or steak. The same is true for mollusks, since you're eating muscle and organs in every bite. I know, that doesn't sound too appetizing, but trust me, mariscada is so fabulous! If you love shrimp, scallops, clams, lobster, and mussels, you will love this stew. Since I've learned how to make it at home (this tastes very true to the mariscada at Ole), my 5-year-old daughter tells everyone that this is her very favorite soup. If you can't get your kids to eat liver or other organ meats, try giving them mariscada once a week. They'll love it, and it will be your little secret that they are being so well-nourished. Oh, and if your kids are picky don't like the shellfish at first, don't push — just let them have the rice with some of the soup. Just keep serving it over and over again and in time, they'll learn to love it. 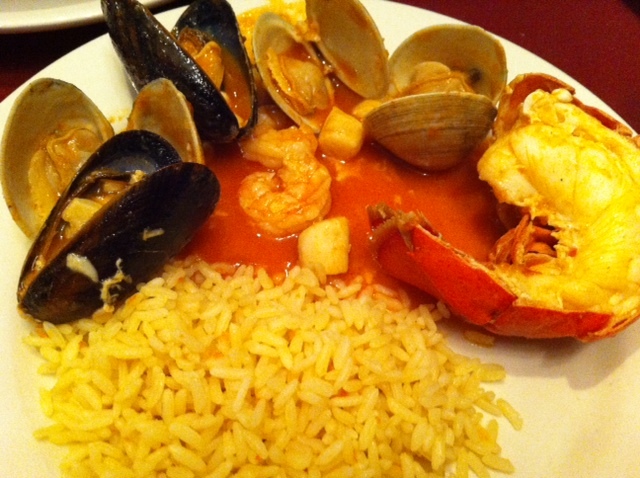 Mariscada is traditionally served with rice on the side. We almost always serve it with soaked or sprouted brown rice. If I don't have any soaked or sprouted brown rice on hand, I'll use white rice in a pinch. But I prefer the flavor of brown rice, and it's more nutritious. A pitcher of sangria is a good complement, as is some freshly baked sourdough bread with butter. If you can't find fish stock, or don't have any homemade fish stock, you can use chicken stock. However, mariscada is much better with fish stock. Don't worry — the garlic and tomato flavors eclipse the “fishy” flavor of fish stock. If you have to use chicken stock, I recommend using 1/2 chicken stock and 1/2 clam juice. Otherwise, you just can't get the right flavor. You can substitute other types of seafood if you can't find these specific kinds. It would be fine to include squid, crab, and/or other types of seafood. Don't worry if you can't find saffron or lobster tails — it's just as good without those ingredients. I usually only add the lobster tails on special occasions, like when Kate's grandparents are visiting. Don't skimp on the garlic. You can save the leftover shrimp and lobster shells (and any bones from non-oily fish) to make fish stock. See my recipe for fish stock here. 1. Peel and crush the garlic cloves. 2. Add the butter or coconut oil to a stockpot and let it melt on medium heat. 3. Stir in the crushed garlic and cook for a few minutes, until aromatic. 4. Optional: Stir in a few pinches of real saffron threads and let cook for another minute. 5. Add the tomato puree and fish stock or chicken stock. Stir to incorporate. 6. Season with sea salt and freshly ground black pepper. 7. Bring up to a boil. Once boiling, you can turn it down to a simmer and let it cook for a while or you can leave it boiling and get ready to throw the seafood in. 8. Debeard the mussels. Remove the little hairy bits on the side of the shell. 9. Right before you are ready to eat, throw in the clams and mussels. Wait for them to open and then remove them with tongs and place them in serving bowls. 10. Next throw in the lobster tails, shrimp and scallops. Just just a few minutes, until the lobster is cooked through and the shrimp are pink. As they are done, remove them and put them in serving bowls with the clams and mussels. 11. Pour the soup over the seafood and serve with rice on the side. Looks incredible! I wish I could get decent seafood, I haven’t found any good places anywhere. I have been looking for a recipe for Mariscada for a long time! One of my favorite restaurants makes it from scratch and it is awesome! But, now I can make it myself with top grade seafood. So nutritious! So delicious. I ate a ton of it when I was nursing no. 1 and preggo with no. 2.